So far, no one has had the cojones to clone the Wiimote. Then Nyko stepped up to the plate and announced the Wand. Playing with it at CES, I was impressed. Holding the Wand, I could perceive no tangible difference (size, shape or weight) from the Wiimote. It's not a bulky or strange product. The Wand is a reasonable doppelganger if you can look past the red, white and blue chromatics. In testing the Wand with Wii Sports bowling and just browsing through the menus, I didn't notice any quality/responsiveness issues (though, we probably won't be able to judge its precise calibration until mass amounts of users post their impressions after release.) Since the Wiimote isn't a 100% perfectly responsive device as it is, it's tough to tell if anything has been lost in Nyko's translation. One big advantage to the Wand, however, is that Nyko is using it as the basis for their new Trans-Port peripheral technology. While most Wii peripherals (like the Zapper) use mechanical contacts to link a trigger to an actual button on the Wiimote, Nyko makes this connection digitally. Examining their prototype Zapper, I could really tell how much simpler the Trans-Port design could be. And Nyko explained that not only could they then remap buttons on attached peripherals, but transfer vibration information as well. So the next Nyko-branded Nunchuk may vibrate. On the market in a few months, Nyko hopes to price the Wand between $30 and $40—hopefully closer to $30. The Nyko Wand is the world's most advanced alternative to the Wii Remote™ and has been designed from the ground up for superior functionality, comfort, and value. The new controller maintains all of the control functions Wii gamers expect with full motion-sensing capability, pointer functionality, vibration feedback, and a built-in speaker, while offering a variety of new features. The Wand contains Nyko's all-new Trans-Port™ technology, which enables control and vibration feedback to be electrically replicated on a compatible attachment accessory, providing for faster and more accurate input response. Current attachments made for the Wii Remote can only access buttons through use of mechanical triggers and provide no vibration feedback. 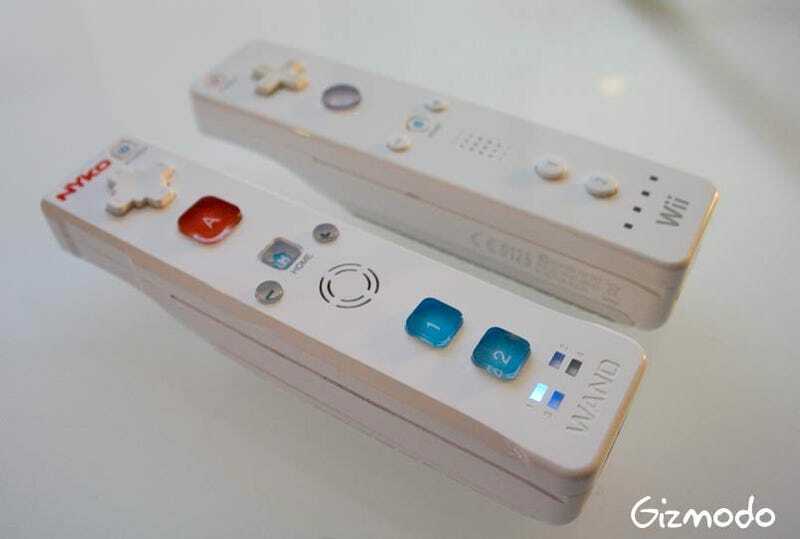 One of the many potential uses of Trans-Port technology is a pistol grip that connects to the Wand and electrically replicates key action buttons, providing controls not currently accessible with attachments for the Wii Remote. In addition, enlarged 1 and 2 buttons make the Wand an exceptional choice for classic gaming control when turned sideways, complete with Nyko's signature rubberized battery cover to ensure maximum comfort and grip.